wife of the Imperial Chorister, Colonel Andrei Theodorovich Petrov. Widowed at the age of 26, a pilgrim for 45 years, she lived a total of 71 years. She was known by the name Andrei Theodorovich. May whoever knew me pray for my soul that his own may be saved. Amen. Nothing is known of the early life of Blessed Xenia, she was born sometime around 1731 and became the wife of Colonel Andrei Theodorovich Petrov, one of the lesser nobility of Russia. From his social status we can assume that she lived a comfortable life moving among the “higher class” of Russian citizens. Her world collapsed when Xenia was 26: her husband died suddenly one night at a drinking party without the opportunity to prepare his soul with Holy Confession and Eucharist. Overwhelmed by grief she realized the emptiness of her life and of Russian high society, gave away her possessions to the poor, dressed in the clothing of her deceased husband and insisted that people refer to her by his name. The words of our Lord Jesus became real to her: “What shall it profit a man to gain the whole world and to lose his soul?” (Matthew 16:26) Xenia even gave away her home to her friend Paraskeva Antonova which convinced her relatives that she had lost her mind. They petitioned the court to name them trustees of her late husband’s estate. After an examination she was found to be perfectly sane with the right to dispose of her property as she wished. She became a homeless wanderer: wandering the streets of St. Petersburg in the daytime and going into the fields to pray at night. Secular, worldly people assumed that Xenia was insane in her grief but in reality she had undergone a profound spiritual transformation. She turned away from earthly possessions and even from the opinion of her relatives and friends and totally devoted herself to seeking more fully the Lord Jesus Christ and His salvation. During this time of her daily wanderings, around 1794 a new church was being built in the Smolensk cemetery. When the workers arrived each morning to continue the construction they noticed that during the night someone had hauled piles of bricks to the top of the scaffolding for the day’s work. Only after a worker remained hidden one night was it discovered that Blessed Xenia was their secret helper. This church stands till today not far from where the blessed one was later buried. Other people slowly began to notice other unusual things about Xenia: whenever she was welcomed into a home, peace and happiness seemed to enter with her. When sick children were held in her arms, they often became well. She seemed to have the spiritual gift of clairvoyance: the ability to predict future events. Numerous stories have been recorded of this gift. In one well known event she ran through the streets of the city shouting nonsense: “Bake bliny! (pancakes) Bake bliny! Soon all of Russia will be baking bliny! Only days later did her words make sense with the death of the Empress: bliny were often served in conjunction with services for the dead. In 1741 she began to weep saying “There is blood, there is blood! There is a river of blood there! Three weeks later the Tsar Ivan VI Antonovich was overthrown in a violent uprising. Because of her growing reputation for holiness, the residents of St. Petersburg began to welcome her into their homes: considering her presence a source of blessing and grace: she was to them not “crazy Xenia” but “blessed Xenia”. The circumstances of her death are not recorded, probably occurring near 1803 and she was buried in the Smolensk cemetery not far from the church she helped construct. Her grave became a place of pilgrimage and miracles: people would take dirt and stones which would heal the sick. A small chapel was erected over her grave with a constant stream of people lining up to venerate her memory. This writer visited her gravesite chapel years ago on a bitterly cold, snowy Sunday afternoon: there were hundreds of people patiently waiting their turn to light a candle and kiss her tomb. Because of her popularity, the Communists erected a large wooden fence to deter believers, instead they would write their prayers on this fence or slip notes between the fence posts asking for her intercession. She was officially canonized as a saint by the Orthodox Church of Russia during its celebration of the millennium of Christianity in 1988, with her feastday celebrated on January 26 Gregorian Calendar / February 6 Julian Calendar. 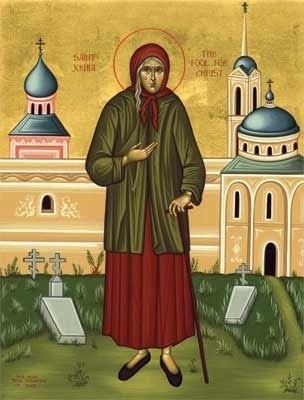 Blessed Xenia, like other “fools for Christ” used extreme measures to avoid the esteem and recognition of people, accepting the reputation as “crazy” and “insane”. Love of honor…desire for rewards, honors, recognition, fame, popularity…this is the most difficult sinful passion that we must battle against. People will turn away from sexual temptation…people will turn away from wealth and material success…but no one will reject honors and awards. There are two kinds of honor we can seek: the first is the honor we receive from God Who promised: “Those who glorify Me, I will glorify” (1 Kings 2:30). The second, most coveted and loved by all is the honor given to us by other people which our Lord described: “Woe, when all men shall speak well of you.” (Luke 6:26) (see “The Ladder of Divine Ascent” by St. John Climacus, Step22) This is the great unconfessed sin, so subtle and so common people rarely notice it in themselves. Even good deeds we perform can be tainted by this sin of pride and desire for recognition and honor. St. John Climacus in his book The Ladder of Divine Ascent wrote: You will know the second kind of glory when you do something, no matter how small, hoping that others are watching. This was the sin of Adam and Eve, not simply that they disobeyed God by eating the forbidden fruit but they succumbed to Satan as he aroused their sinful pride. The serpent convinced Eve that if she ate this fruit: You will not die. For God knows that when you eat of it your eyes will be opened, and you will be like God, knowing good from evil. (Genesis 3:4-5) Even the blessed Apostles of the Lord were infected with this passion: An argument arose among them as to which of them was the greatest. (Luke 9:46) Priests and bishops are not immune from this disease and are easily held captive with the desire for honors, recognition and praise. St. Xenia of St. Petersburg was regarded as a fool for her lifestyle of extreme disdain for worldly opinion and approval. She believed and lived the Lord’s promise: “Those who glorify Me, I will glorify.” Today, over 200 hundred years after her falling asleep in the Lord, her memory is glorified in Orthodox Churches and homes around the world.